Whether it’s for use in the home office or around the ranch, or while you run errands in your city with your concealed carry weapon, when it comes to picking the right concealed carry, or home carry handgun, there are few modern personal defense firearms as venerable as the Glock. As far as concealed carry goes, the Glock 19 offers a generous mix of performance, handling and reliability in an easy to carry package. When it comes to the best Glock 19 holster, there are a few factors that you need to consider. Having the right holster makes all the difference in reaction time, comfort in carrying your handgun and responsibly handling your weapon. This article is mostly about IWB (Inside Waistband) holsters, because they tend to be the easiest to use and to conceal while still maintaining a natural draw and a quick draw speed. As an added bonus, IWB holsters tend to be very easy to maintain and wear with different clothing and the prices are very reasonable compared to many other types of holsters. There are some very good holsters that are not IWB and an example of those will be covered here too. Not Everyone can find a solution with a single type of holster, hence the need for breadth as we cover holsters for the Glock 19. Knowing what to look for and why one IWB holster makes a better choice over another can help you find the best IWB holster for Glock 19. Here are 9 holster options and the basic information you need to know to decide which one makes the most sense for your needs. Printing: The propensity for a concealed weapon to be showing in profile or in bulk outside of your clothing which is meant to conceal it. The ability for casual observers to see “something”; the ability for those in the know, and potential criminals to actually know that you are carrying by such an outline or noticeable bulk. Weapon retention: The passive or active ability for your holster to hold your firearm in the position you desire it to be before you are ready to draw it. This can be achieved through your actions or through design and materials of the holster. Belt Loop Holster: A Holster that connects directly to the belt instead of offering an inside waistband paddle or connection point. These holsters require a stout belt to be worn tightly and can be a bit more wobbly and harder to sit with, when worn. Paddle Holster: A holster which relies on a paddle to rest against your hip in between your waistband and your undergarments. 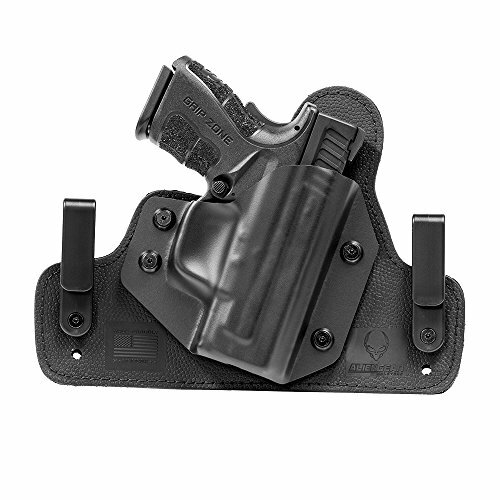 This type of holster gives more contact and therefore more stability on the waistband. Draw Speed: The quickness and smoothness with which you will be able to remove your firearm and come to a position here you will reasonably be able to make an accurate threat stopping shot or shots. This usually is a combination of understanding, situational awareness, practice time, manual dexterity and mechanical conditions of the holster. There is no one aspect that seems to become more prevalent in a real time tactical scenario. 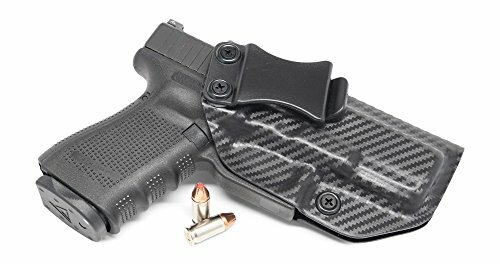 The Concealment Express IWB Kydex holster offers more than most single waistline contact holsters from the IWB portfolio and does offer enough rigidity that you can guarantee good repeatability in draw with a tight belt and good practice. Carry options include appendix, hip, cross draw and palm in back. This holster has easily adjustable retention pressure and carry angle from 0-15 degrees with a Philips screwdriver. Available for both left and right hand draw the materials, warranty and adjustability are very good. Lightweight at 2.5oz. it comes with a 1.5″ ABS standard belt clip. Though it is a bit less sturdy on the single pivot point, the quality of manufacture and the very good adjustability while still maintaining a slim profile and a simple design makes this a very solid choice for those who want the flexibility of a single point waistline contact. Great warranty and solid material quality for the Concealment Express IWB Kydex holster. Minimal to zero "drag" until retention point keeping "holster wear" down to a minimum. Comes with a 1.5" Quick Clip that makes it extremely fast and easy to put on and take off your weapon. Adjustable cant (angle) from 0-15 degrees. Forward hole is oblong to allow for you to choose any angle between 0-15 degrees. Adjustable positive retention point. 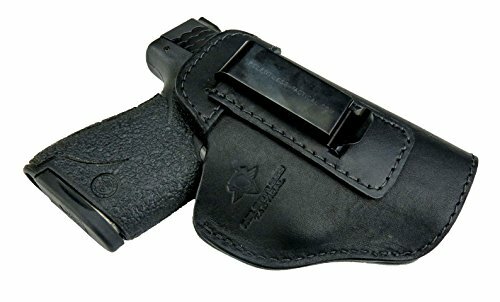 When gun is fully holstered you get a audible and noticeable "click"
Holster has a full sweat shield to aid in re-holstering by giving you and indexing point and to keep clothing out of the opening. The full time rigid Tulster IWB that makes sense for those who sweat the details or sweat a lot in general. The Tulster offers great adjustability and a very safe design while also offering a relatively good price point, given the bevy of value adds built into the holster. Offering minimal to zero drag until retention point which keeps any wear on the holster down. Six different colors to choose from. 1.5″ quick clip included for ease of putting it on and taking it off. Adjustable positive retention point with an audible click once fully holstered. The seriously adjustable, high quality holster made with excellent materials and built for maximum rigidity. 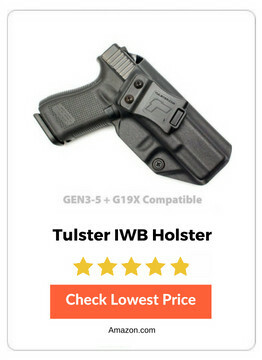 For a single point waistline contact, the Tulster IWB offers unmatched safety if the holster is used properly, and a very solid design and mechanics. Galco Holsters have been market leading designs for more than a generation. This holster represents a great deal of innovation that the legacy brands like Galco normally aren’t known for implementing. In this case, Galco seems to have gotten it right. All the customer feedback that addresses the shortcomings of competitors seems to have been modeled into this holster’s design. Galco is a brand name that has been known for many years as a leader in the industry in quality control and innovation. 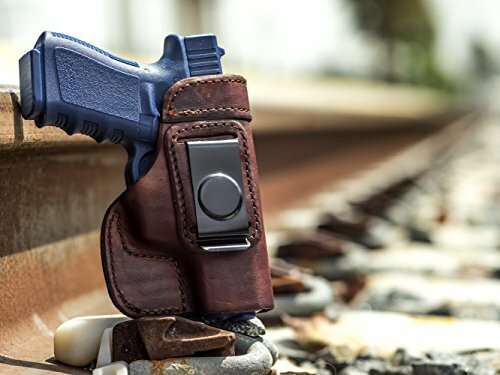 This Galco Holster offers great concepts and follows through on most of the proposed ideas it tries to implement. The slimmer design and dual contact points offers great stability for those who need absolute repeatability in their draw. A great name brand and a very solid material choice considering the actual use case of the holster. However the Blackhawk Serpa may not be quite the rigidity of some of the bulkier IWB’s in competition with it. The possibility of “printing” is perhaps outweighed by the repeatability of draws and the lightweight in total carry feel. The quality for the money is hard to beat for the composite design. This holster has a vocal following that defend its design and bring up many good points. The design gets it outside of the waistband so your hips don’t take as much punishment when you wear it full time. Consistent draw patterns. The repeatability and rigid design of the Fierce Defender holster make it a very good choice for those who value draws that are repeatable to a “T” over sitting comfort or absolute minimalism. The thick .08 Kydex construction is good quality and offers protection against sweat and heat. Strong, durable and molded specifically to your weapon. 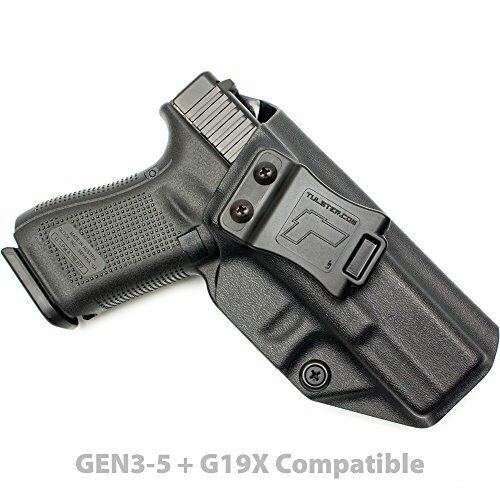 This holster fully covers the trigger and backside of the gun which makes it very safe and protected from external elements. Flared opening design allows for ease of re-holstering and there is an adjustable retention for ease of fit. 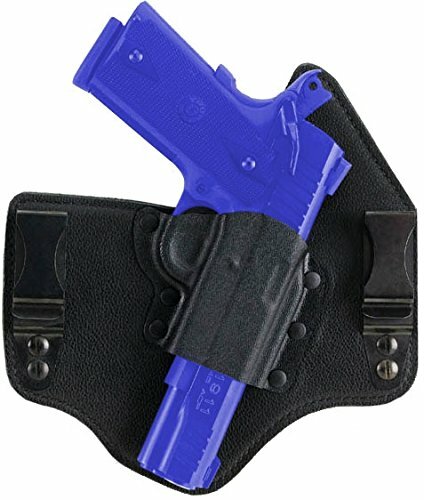 For a single point waistline connection, this is a fully featured holster with a great retention setup and the potential for very repeatable draws. The lack of complexity while still maintaining decent adjustability makes the Fierce Defender holster a very good contender for those who want a single contact point with the waistline. 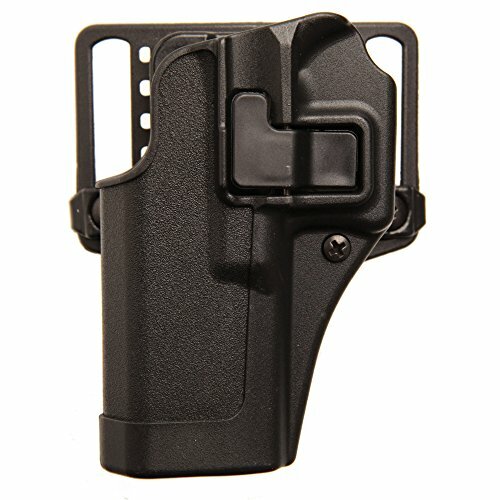 *Notice* The Cloak Tuck 3.0 has been recently upgraded with a new tool-less design with the Cloak Tuck 3.5 IWB Holster. The system from Alien Gear Holsters is a robust solution to sagging waistlines due to heavy carry weapons. The wide platform and the high quality materials are just a couple reasons why the company has rabid fans all over the place. Customer support is relentless and the guarantees are very good. The price point is relatively low and the system just delivers on most of its promises. That said it can be a bit bulky for some, for all of it’s reinforcement and the wide body. 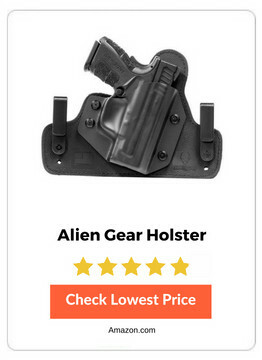 If the Alien Gear Holsters system works for you, you’ll love it forever. The solid feel and security of the system makes it very reliable and easy to make repeatable draws in practice and in stressful situations. The price is an excellent factor, as it is low for what you get. Inside Pants Holster. NOT for Outside Pants or Small of Back! Handcrafted in USA from full grain leather. This is a hard-molded leather holster. Brown dye will vary in range from medium to dark brown. Holster belt clip will vary as shown in the photographs. The simple and easy to use Outbaggs Full grain leather holster that functions as a quickly adjustable IWB for your firearm. It is an easy choice for those who want the ultimate in adjustment from a single pivot point. While this can cause some stability issues, it generally doesn’t affect draw if a proper belt is in use. Doesn’t cover as much of the firearm as some other holsters so unless you are wearing a tight belt and are used to the feel of the holster, it can feel loose at times. The original design and very easy to maneuver positioning due to the small waistline clip profile makes it fast to adjust, and while that might make the holster feel a bit wobbly, sometimes seated comfort is an absolute necessity. The leather conforms to your body and the gun, making the Outbaggs Full grain leather holster feel like an old friend. Made in USA - WE STAND BY OUR QUALITY: 100% Satisfaction Guarantee, No questions asked return policy and Lifetime Warranty. A simple enough holster made with rigid and semi rigid materials makes this a good mix of flexible and comfortable, but also rigid enough for repeatable draws. 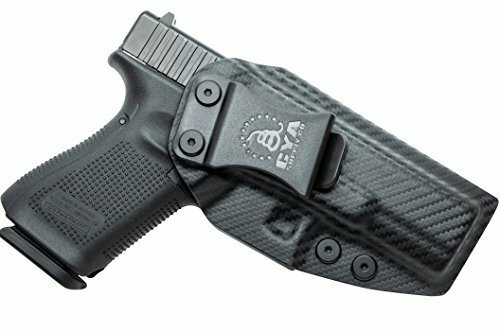 The lightweight design fo the CYA Supply Co and the IWB platform makes this a good choice for those who need something a bit more rigid but don’t want to go to a wide design. The quick in-service time and the easy profile to move around makes this a very nice holster for quick adjustment and relatively solid draws. The high quality materials and excellent no-questions-asked warranty make the CYA Supply Co a solid choice. HANDMADE BY AMERICAN CRAFTSMEN FROM GENUINE USA BULLHIDE LEATHER! American made with American Pride! No synthetic materials or cheap mass-market production. BACKED BY RELENTLESS TACTICAL'S LIFETIME WARRANTY! Carry the best IWB Holster on Amazon with confidence for the rest of your life. With quality American Made construction comes great durability. That is why we can offer a Lifetime Warranty on each and every leather product we sell. FITS MOST FULL SIZE & COMPACT HANDGUNS IN 9MM, .40 & .45! Glock 17 / 17L / 22 / 31 | Glock 19 / 19X / 23 / 32 | Glock 26 / 27 / 33 | Glock 43 | S&W SD9 / SD40 | H&K VP9 / VP40 | S&W M&P Shield (9mm, .40 and .45) | Sig Sauer P226 / P229 / P250 | Springfield XD, XDS, XDM | Taurus 111 / 140 Millennium G2 / G2C | Will fit too many models to list them all!! SAY NO TO CHEAP NYLON HOLSTERS! Why settle for inferior nylon or imitation leather when you can have a Genuine Made in the USA Bullhide leather holster with our complete Lifetime Warranty? DESIGNED FOR OPTIMUM PERFORMANCE AND MAXIMUM COMFORT! Sturdy dependable and form-fitted for easy effective concealment and quick reliable access. The Relentless Tactical is handmade from genuine USA Bullhide Leather with no synthetic materials at all. Extremely high quality, this holster is durable and comes with a lifetime warranty to further attest to the quality. 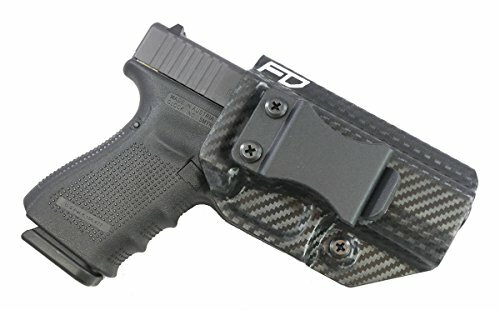 Designed for maximum comfort and optimum performance, this holster is sturdy and form fitted for ease of effective concealment and quick access. Not as form fitting as other competitors so without a tight belt this could affect draw speed and repeatability. 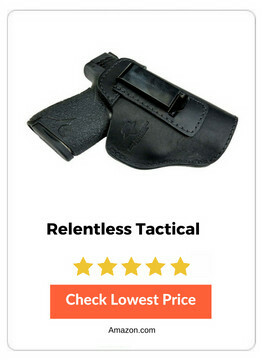 If you want a simple design and an all-natural leather holster then the Relentless Tactical is a great choice. The high quality materials and construction, when paired with a tight belt and some good practice can yield a very good draw and extremely good retention without feeling as bulky as other holsters that are based on the IWB design. A huge deal in the IWB market right now, Custom Kydex holsters can be vacuum formed near instantly to fit the exact needs you have for your firearm and for movement or condition specifics for carry. These are a rigid plastic material that can be slightly uncomfortable and non-flexible under certain circumstances. The original material, a natural material that gets better over time if you keep it maintained properly. The Leather holsters will start very tight and shape themselves over time to your firearm so that the firearm can be held exactly as needed for retention and draw purposes. Some drawbacks include wildly varying qualities of leather between brands and the tendency for moisture or heat to negatively affect the integrity of the holster over time (this includes sweat). The softest, least rigid and least durable material under most circumstances. These have a definite place in the discussion, but innovation in materials and retention are beginning to make this material obsolete in many ways. For comfort and flexibility, it still reigns supreme. A cheaper plastic that doesn’t have heat vacuum capabilities of Kydex for customizing, this is a material often found in lower cost holsters and can be very flexible without being easily broken depending on the quality of manufacture and the design style. Almost all holsters combine several materials to arrive at the finished product that you will use as an end user. You’ll find metal and polymer and rubber and other materials in addition to the above materials. They all work in harmony to provide the flexibility, comfort, retention or draw speed you need to get yourself in the game in a tactical shooting scenario. Most inside the waistband holsters are within a relatively tight size range. What you really need to consider is where the main weight point will be on your belt/waistband and how thick or how outwardly oriented the holster is. This will make a huge difference in avoiding “printing” or being awkward to sit with or draw from a seated position. Both concerns are related mostly to the size of the weight focal point or the position of the holster in relation to your body when worn. Generally, IWB holsters are easy to conceal your Glock 19 in, but they can pose some difficulty in seated positions. Believe it or not, wearing a holster can be extremely tiring and annoying at first. It may take several days to get used to balancing and sitting with a holster on. The level of discomfort can be high for a while until you find the most common positions you’re likely to be in during normal day to day events. Like a new pair of hiking boots or a baseball glove, you need to wear it, use it, live with it for many days and unfortunately quite a few uncomfortable hours (though with the right holster choice you can minimize that substantially) until it becomes an extension of your body. You will eventually find yourself touching your holster and resting your hand on your pistol grip more than you think. At some point beyond that, you kind of forget that the holster is there, until instinctively, you react to an imminent threat. Muscle memory and awareness will play a major role in using your new holster effectively. Be sure you devote adequate time to developing these traits. Being aware of your surroundings is always an important part of effective concealed carry. A majority of the time, the situational awareness you bring to a space will be the determining factor in how the outcome of a personal defense scenario plays out. Being aware of what you are wearing, who is a threat and what is around you, can make a huge difference in the way you react to a tactical self defense situation. Where your holster is riding and what you will do in the case of an imminent threat are important things to consider at a relatively frequent interval. This type of thought process shouldn’t overwhelm your thoughts, but it should be a cognizant part of your overall awareness. You might be a very good shot at the range. You might be a very fast draw. It takes a lot of practice to learn how to draw quickly, safely and accurately fire off a shot, or two, or three. This is infinitely harder if you don’t practice in the different types of clothing you might be wearing in different weather conditions or in different social settings. Not being able to competently draw your weapon with a winter jacket on, or not being able to effectively conceal your (Glock 19) firearm in work clothing can cause issues that do not only center around protecting yourself. Practice generally is cheap and easy. More than anything it equates to drawing your Glock 19 from the holster in the privacy of your own home with an unloaded firearm at different times with different conditions while roleplaying different scenarios that are likely to exist. Most people will have access to excellent concealed carry trainers when they take the step to begin the concealed carry license process. These trainers know your local area regulations and can help you not only to navigate the concealed carry permit process, but will also help you to understand state laws, how to be a better shooter and what not to do in the case of a defensive shooting scenario. While the scope of this topic is much too large to discuss in an article about the best IWB holsters for a Glock 19, the importance remains. You need to understand when it is legal to draw your weapon and under what circumstances. You need to know what constitutes an imminent threat to your safety or life. You also need to know where it is appropriate to carry a concealed firearm, and how to react to and interact with law enforcement, or other people in daily situations. Knowing this information like the back of your hand will keep you out of legal trouble and ensure you the peace of mind that can only come from carrying confidently and knowing you are able to mitigate threats around you properly. Just like with firearms, having something that works for you is what’s most important. If you ever find yourself in a situation where you must draw your weapon to protect yourself, you need to know you can do it safely, responsibly and competently. An important variable to the equation is a Glock 19 concealed carry holster that fits you in the right way and allows you to draw reliably and engage a threat in the proper way. In the grand scheme of things, the holster is important, the gun is important, and the ammo is important, but what is crucial is your state of mind and your ability to react accurately and decisively in a personal protection situation whether it be at home or at the office, in the car or in the supermarket. That said, having the right gear is very important, and researching and comparing gear is a good place to start. Hopefully this article has helped to shed some light on the available gear and their distinguishing characteristics. Choosing the right glock 19 holster is very important, and researching and comparing gear is a good place to start. By sharing my knowledge I hope to have provided an insight into the best products and their features. 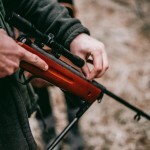 9 Best AR 15 Bipod Reviews for 2019! Cannon Gun Safe - How Are They Different From Traditional Gun Safes? Winchester Gun Safe - How They Are Different From Traditional Gun Safes?